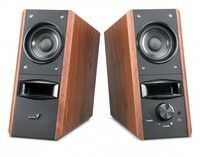 Genius introduces a new contemporary 2.1ch subwoofer speaker system, Lumina. With its ultramodern white color scheme and luminous backlight, it blends in perfectly anywhere at home or around the office. The stylish cone-shaped subwoofer has a 3-inch driver unit with a specially designed S-type air hose to deliver deep and rich bass performance. The dusky orange backlight underneath each curvaceous satellite speaker makes Lumina captivating as a decorative piece for your home or office. With a sleek artistically designed subwoofer and hourglass shaped satellite speakers, this system not only sounds great but looks like a modern piece of art. The elegant satellite speakers have a 2-inch driver unit for clear and detailed mid and high range frequencies for realistic sound. There are also volume and bass controls with an orange and blue LED underneath the remote and wired controls. In addition, Lumina includes an extra AUX-in for audio input from various mobile devices for personal enjoyment. Besides a wired control, there is an IR remote control in the package so you can use either one for control. Lumina is ideal for listening to music, watching movies or playing nighttime music with a wide range of frequencies and enhanced bass. 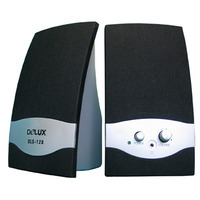 Get the Lumina speaker system that looks and sounds like pure artistry!